A combination of supporting factors helped the GBP/USD pair regain some positive traction on the first trading day of a new trading week amid absent relevant Brexit headlines. The British Pound remained supported by the fact that the EU leaders granted the UK a second Brexit extension until Oct. 31 and got an additional boost on Monday after the UK Foreign Secretary Hunt said that the Brexit talks with the opposition Labour party were more constructive and detailed. This coupled with persistent US Dollar selling bias, this time led by the US President Donald Trump's latest criticism against the Fed's policy tightening, remained supportive of the intraday positive move. Meanwhile, the USD bulls failed to gain any respite from stronger than expected NY Empire State Manufacturing Index, which jumped to 10.1 for April as against 6.0 expected and 3.7 previous. 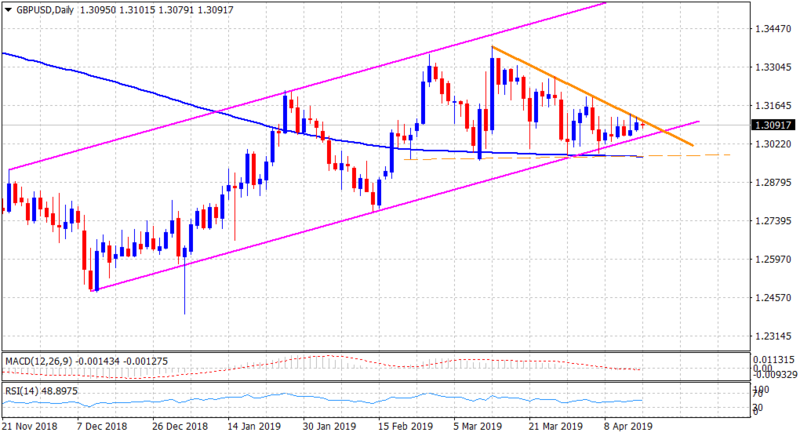 The pair touched an intraday high level of 1.3119 but once again failed to build on the momentum and failed to surpass a five-week-old descending trend-line resistance. The pair witnessed a rather subdued trading action during the Asian session on Tuesday as market participants look forward to UK employment details for some meaningful impetus. The UK unemployment rate is expected to remain unchanged at 3.9% for the three months to February and earnings, excluding bonuses, are also seen holding steady at 3.4% during the reported period. Meanwhile, earnings including bonuses may rise to 3.5% from 3.4% whereas claimant count change is seen at 20K as against 27K previous. Looking at the technical picture, the pair has been ranging within a familiar trading range over the past one week or so and hence, traders are likely to wait for a convincing break in either direction before positioning for the near-term trajectory. A convincing break through the mentioned trend-line resistance, currently near the 1.3115-20 region, might prompt some aggressive short-covering move and assist the pair to aim towards reclaiming the 1.3200 round figure mark. A follow-through buying has the potential to lift the pair further towards the 1.3265 supply zone before bulls eventually aim to surpass the 1.3300 round figure mark. On the flip side, the 1.3050-40 region, marking the lower end of over four-month-old ascending trend-channel might continue to protect the immediate downside, which if broken might accelerate the fall further towards the key 1.30 psychological mark en-route the very important 200-day SMA support near the 1.2975-70 region. Failure to defend the mentioned supports would mark a near-term bearish breakdown and turn the pair vulnerable to continue drifting lower towards testing sub-1.2900 level.